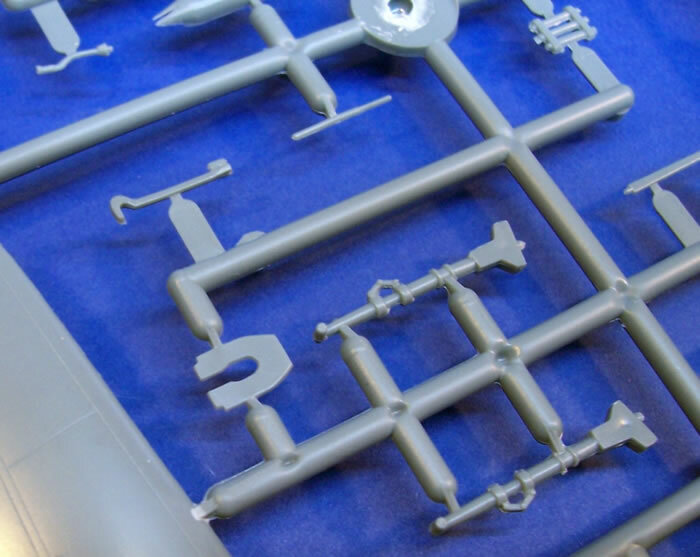 The kit has seventy grey and six clear styrene parts, three resin parts, and decals for three colour scheme options. This is a good quality kit with nice surface and interior detail. 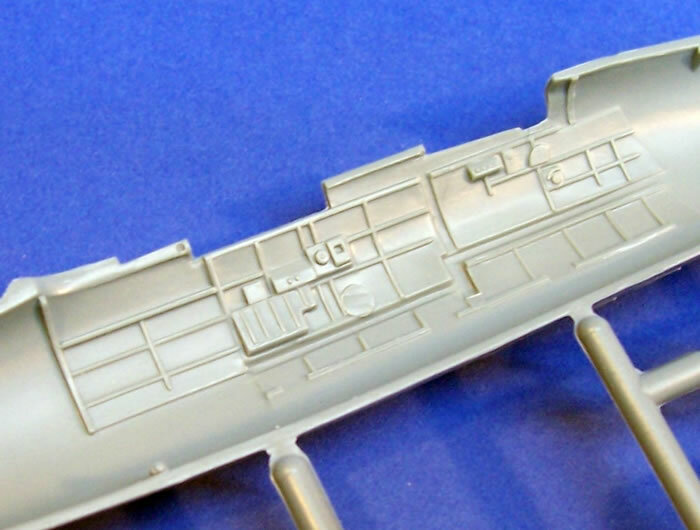 The option of a torpedo and open or closed bomb-bay is nice to have, as is the choice of or closed canopies. Paint colour information is generic. This nicely engineered kit is produced to high standards, but is let down just a little by inadequate camouflage colour information. 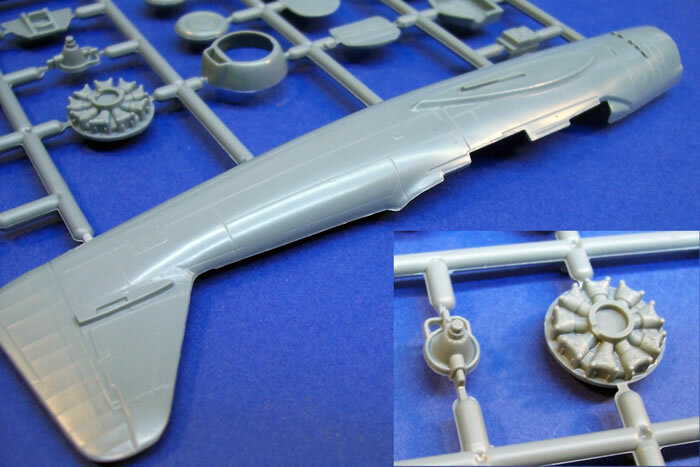 It looks to be a nice straightforward build with the potential to produce a very attractive and interesting model. 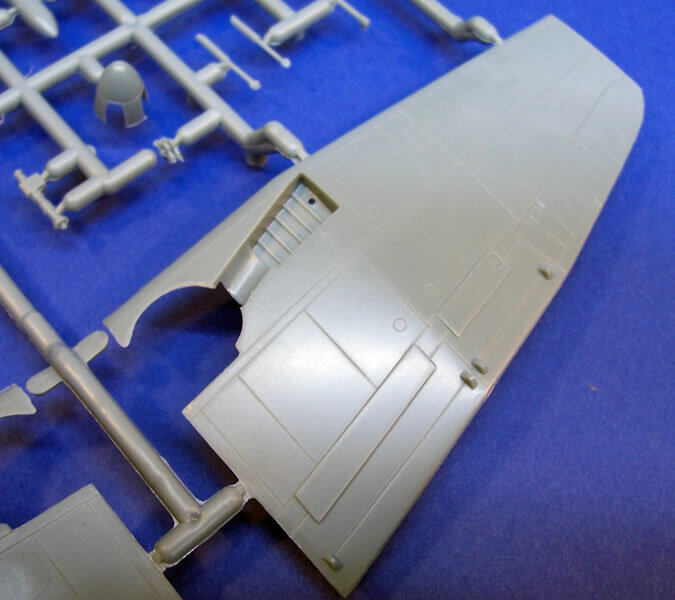 Detail levels are good all-round; and it is nice to have the open bomb-bay and open canopy options as well. It appears to be a real advance over the old Fujimi kit in all respects. 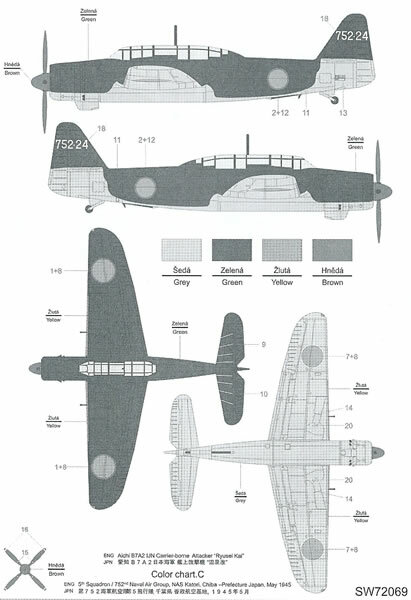 The Imperial Japanese Navy issued a requirement for an aircraft designed to supplement and ultimately replace both the Nakajima B6N torpedo/horizontal-bomber, and the Yokosuka D4Y reconnaissance/dive-bomber. 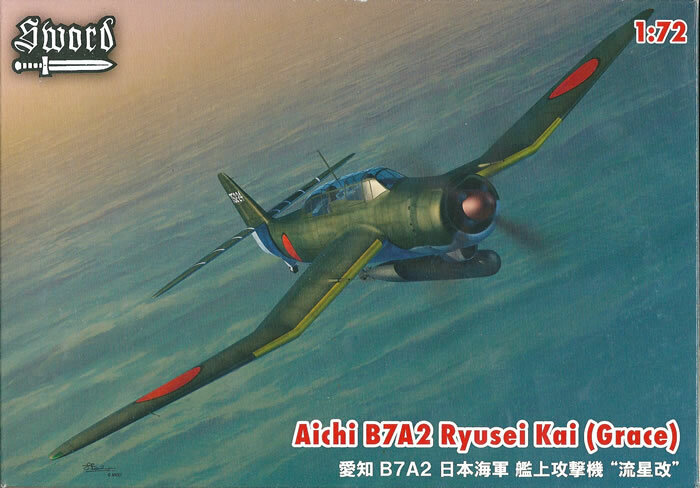 Aichi responded to this design requirement with what became the Aichi B7A Ryusei. It was to operate from a new larger class of carrier with larger elevators than previously used by the Japanese, and this removed some restrictions on airframe size. The Navy required that the B7A be powered by the Nakajima Homare 18-cylinder radial engine, which was in the 1,800-2,200-hp class. This engine was to prove unreliable initially, and it delayed the aircraft’s development and introduction to service. The B7A was required to carry its bombs internally, and this meant a mid-wing design was adopted. 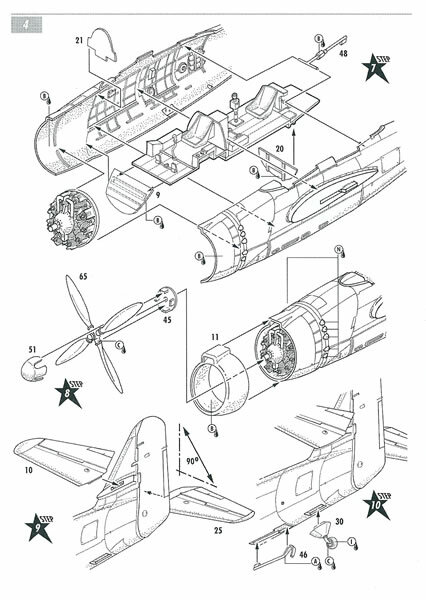 This decision, along with the large propeller required by the Homare engine, favoured the adoption of an inverted gull wing to reduce undercarriage length; and therefore its weight. The wing also featured ailerons that drooped 10-degrees to augment the flaps, and had dive brake just ahead of the flaps. The design proved to be both fast and very manoeuvrable. However, as with many Japanese designs commenced in the 1940’s, it was a case of too little, too late. By the time it was introduced to service, there were no large carriers for it to operate from; and so by default it became land-based. Only 114 B7A’s were completed. 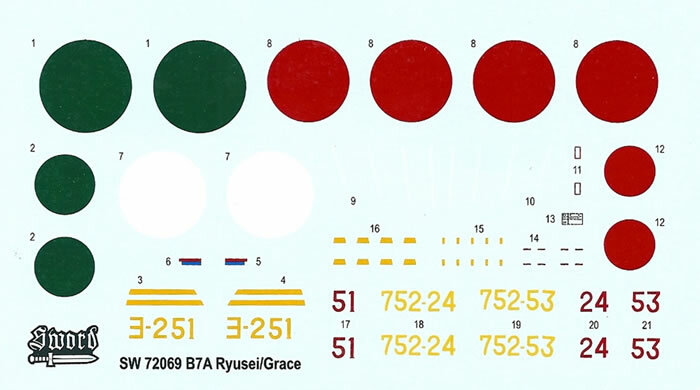 By far the best-known B7A kit is from Fujimi, with various boxings covering both the B7A1 and B7A2 variants. 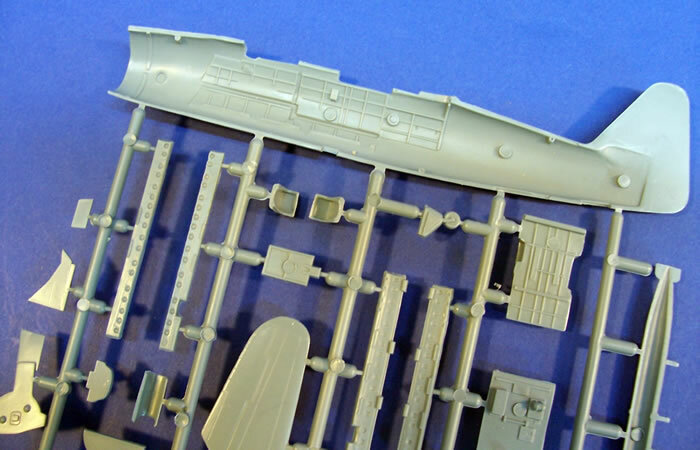 Vac-from B7A2 kits were issued by Eagles Talon and Wings 72, and another kit by Ikko. I have no other information to share regarding these last three kits. However, the Fujimi kit was as I recall typical of that brand’s releases from the 1980’s. It was relatively simple and crisply moulded, with very basic cockpit and engine detail, and finely engraved panel lines. Suffice to say, a more modern and detailed kit of this rather interesting aircraft is to be welcomed. 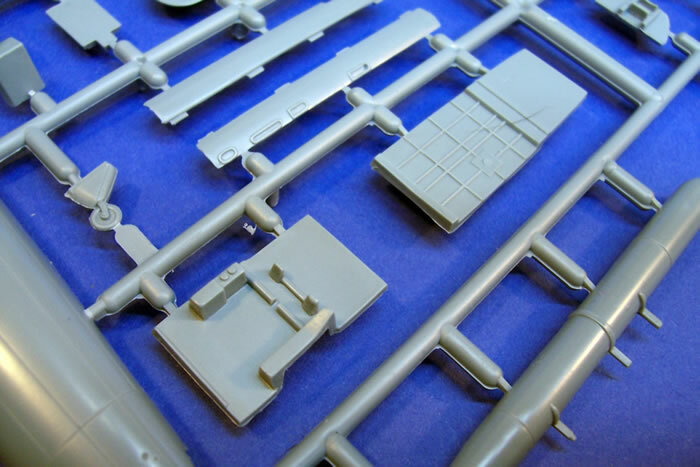 This is a typical Sword kit in that the plastic has a more shiny finish, the cleanly moulded parts have very fine surface detail, and the sprue gates are narrow. There is just a little flash in places, but this is easy to deal with. 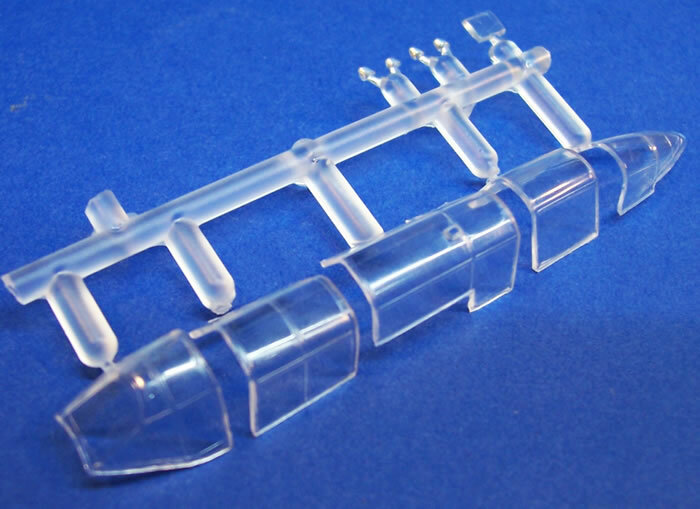 The three resin parts are also well cast, although they only account for two cannon barrels and a DF-loop. 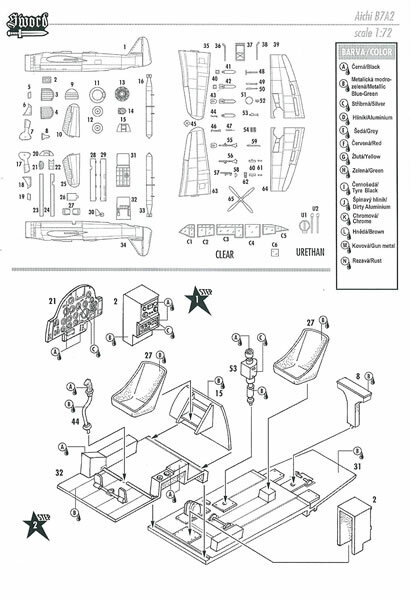 Parts break down is largely conventional for the type. Cockpit detail is a huge advance on the old Fujimi kit, and is quite comprehensive for an all styrene effort. 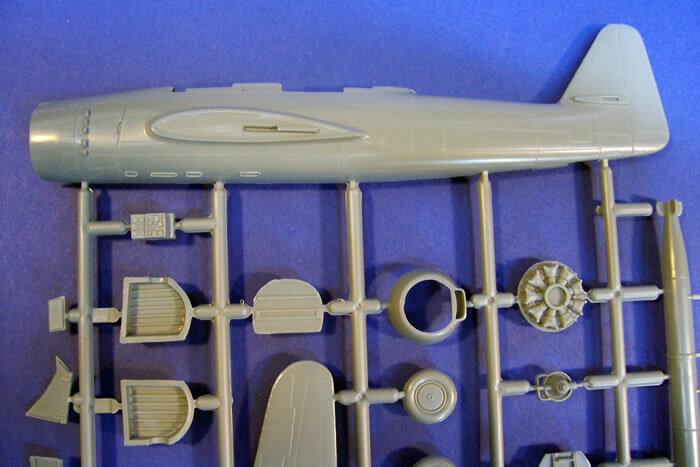 Aside from the obvious floor, seats, instrument panel and control column, it also offers a sight for horizontal bombing, oxygen bottles and plenty of detail moulded integrally with the fuselage halves. Once all of this is enclosed by the fuselage halves there remains a gun-sight for the pilot, some decking between the seats to which the resin DF loop is mounted; and a nicely done heavy machine gun for the rear cockpit. The seats have no harnesses moulded with them, but it is worth adding homemade or PE belts to dress things up some more. Taking a procedural step back, you need to decide whether to model the bomb-bay open before joining the fuselage halves. This is because you must cut away the closed doors to display the bomb crutch and bombs if you fit them. Separate bi-fold bomb-bay doors are provided for the open option, so the cuts can be conservative, with final finishing to the hinge line achieved by judicious trimming and filing. However, you will need to make a careful cut of the small bomb-door window that falls across the bi-fold hinge line. I think that Sword could have provided a two-part version as well as the solid one for the closed doors, but this matters little. You also have the option of mounting a torpedo if the bomb doors are left shut. There is an arrestor-hook to fit, but I cannot comment as to whether these were ever removed for land-based operations or not. The radial engine is a single-piece moulding representing the two rows of cylinders. Although far from stunning, it is quite adequate for the job once the characteristic ignition harness piping and reduction gear housing is added. The whole unit is closely cowled, and not much will be visible as a result. 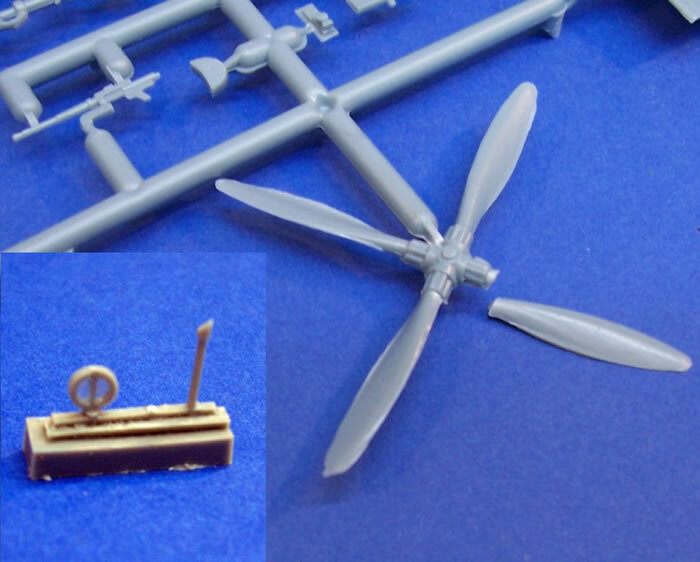 The four-blade prop and spinner is quite nicely done, but the prop’s position on the sprue seems ill considered, as it sits with some blades unprotected on the open side of the sprue adjacent to the end of the box. As a result, my sample had a blade snapped off, and I should think that this would prove to be commonplace. A separate oil-cooler fairing and its matrix fit on the underside of the cowling. There are four ejector exhausts to be added to the lower cowl despite the remainder being moulded integrally with the fuselage. I suspect that this is a concession to the two-piece tooling, ensuring that the need to separate the mould halves does not compromise the shape of the ejector stubs in this area. The wings are straightforward affairs, with separate main wheel wells. 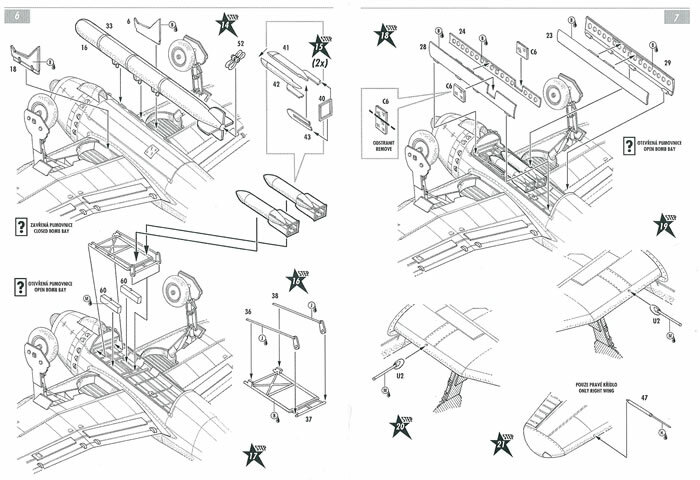 A head-on view arrangement drawing illustrates the correct angle for the wing to fuselage join. 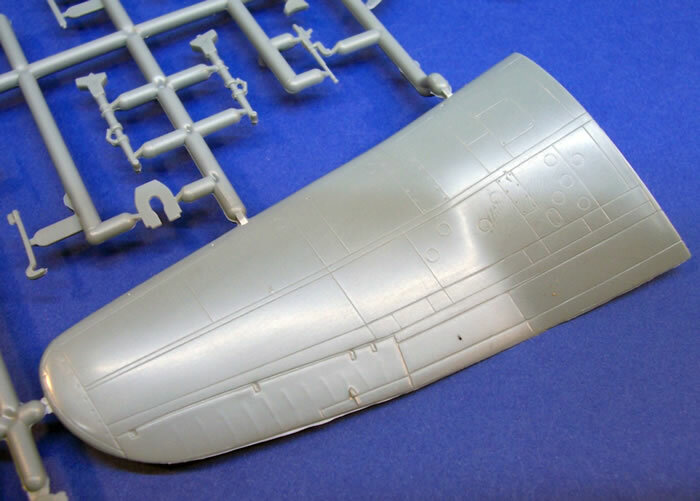 The cannon are resin items, despite the kit featuring equally fine items moulded in styrene, such as the starboard wing’s pitot. Of course, there is also the tailplane to fit; which like the wings, uses small tabs to aid location and add strength to the join. The sturdy undercarriage looks good, and should locate firmly. The wheels are moulded as one-piece items, and do not suffer from sink marks despite their thickness. The canopy is very nicely done, being quite thin and clear. It is supplied in five pieces, allowing both the pilot’s and gunner’s sliding hoods to be modelled open. Both slide backwards on the real plane, so the gunner’s will potentially screen the rather nice machine gun if modelled open. I could not find any definite information as to how the rear machinegun was exposed for use; only that it is likely to be similar to Aichi’s M6A Seiran. Therefore, it seems that rearmost half-cone shaped piece of canopy over the rear machinegun rotated about its longitudinal axis to lie under the gun’s barrel. I would be inclined to leave well alone given the uncertainty about the mechanism used. 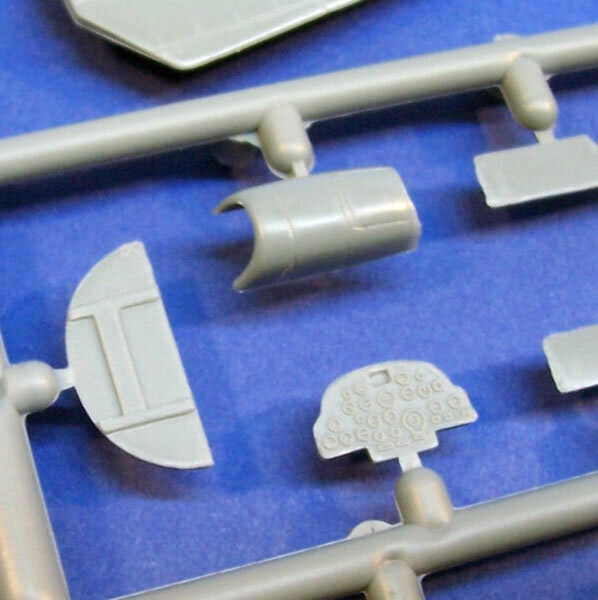 All three of this kit’s decal options wear essentially the same colour scheme of IJN Dark Green over IJN Light Grey (although Sword describes them as simply green and grey respectively). I should think that there was very little, if any, variation on this scheme anyway. Therefore, unit and national markings aside, there are only the deep yellow wing leading edge identification bands and drift stripes on the tailplane to add to the simple scheme. The kit provides the drift stripes as decals. 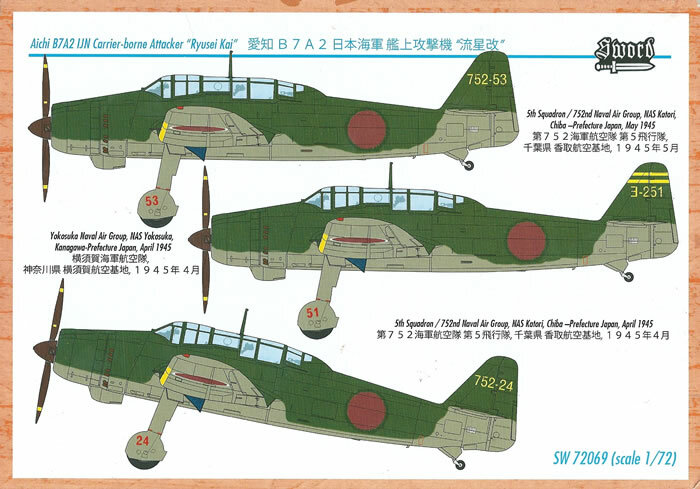 The aircraft covered by the kit decals were all based in Japan in 1945. These being two aircraft of the 5th Squadron, 752nd Naval Air Group, NAS Katori, Chiba-Prefecture, in May; and one from the Yokosuka Naval Air Group, NAS Yokosuka, Kanagawa-Prefecture, in April. The decals are well registered, appear to have good opacity. The hinomarus have separate white and dark green backing disks to aid with registration.